NEW YORK (CNNMoney) -- Ken is on a mission this year. He wants Barbie back. He's sporting a new Justin Bieber-like look, and a new name: Sweet Talkin Ken. And he's not holding back in his quest to woo Barbie back -- by Valentine's Day. Don't be surprised if you see billboards in New York and Los Angeles with Ken professing his renewed love for his ladydoll, declaring "Barbie, you are the only doll for me." Even better, " Barbie, we may be plastic but our love is real." Ken's thinks he's the ultimate boyfriend but Barbie fans will have to wait a few more weeks to find out if he succeeds in his quest. Breakup that rocked the world: Ken and Barbie shocked their fans -- and the world -- when the doll world's "golden couple" went splitsville in 2004. The couples' romance began 50 years ago when they met on the set of their first television commercial together in 1961. When they unexpectedly split, their PR reps said both Ken and Barbie needed to spend "some quality time apart." Even celebrity dolls' relationships can crack under the constant glare of the media. More skeptical observers called it a very clever publicity stunt aimed at reviving sagging sales of Mattel's (MAT, Fortune 500) most iconic brand. Barbie was slowly but surely getting knocked off the toy shelf by her funky hip-hop nemesis at the time -- Bratz dolls. So Mattel needed to spice up Barbie's game. What better way to do that than through a carefully crafted split up with Ken? Barbie sales in the United States have improved over the last few years. 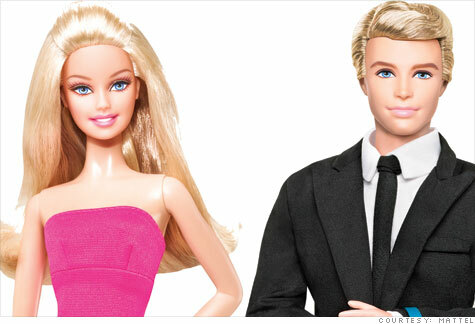 Now maybe if she decides to take back her "arm candy," Ken could help Barbie become this year's queen of dolls.